Beijing launched a crude oil futures contract denominated in the Chinese yuan on March 26, in a move that could significantly enfeeble the international influence of the United States dollar. The contract lets foreign investors buy and sell crude oil on the Shanghai International Exchange with yuan rather than dollars. Reuters said it “kicked off to a roaring start,” with 15.4 million barrels of crude changing hands in the 2½ hours of the first day of trading. “This could be a death blow for an already weakening U.S. dollar, and the rise of the yuan as the dominant world currency,” economics blog ZeroHedge wrote of the launch. Since the 1970s, global oil trade has been conducted almost entirely in U.S. dollars, also known as “petrodollars.” The petrodollar system boosts global demand for U.S. dollars, increases international demand for American debt securities, and allows Washington to purchase oil with money it can print at will. Continual conversion of petrodollars into U.S. Treasuries has helped fuel America’s immense deficit spending. Since China overtook the U.S. last year to become the world’s number one importer of crude oil, Beijing may now be positioned to topple the petrodollar with a petroyuan. 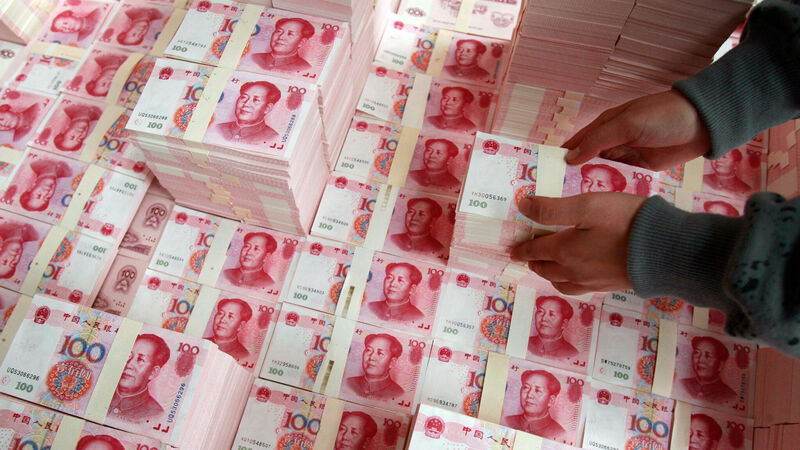 Oil-exporting nations remain concerned about the viability of the Chinese currency in the international arena. The concerns center on the fact that the Chinese government routinely interferes with the machinations of local commodity markets. And the nation is not a market economy. But for some major oil exporters, the desire to end the era of American dominance may override these concerns. Since 2015, Russia and Iran have both taken steps away from the dollar and toward the yuan. Last September, Venezuela signaled its willingness to abandon the dollar by publishing some prices for its oil in yuan. And in January, Pakistan approved use of the yuan for bilateral trade. But China is unlikely to topple the petrodollar without participation from the world’s largest oil exporter, Saudi Arabia. Procuring that participation is high on Beijing’s priority list. “China is now trying to persuade Saudi Arabia to start accepting the yuan for its crude oil,” wrote international oil economist Mamdouh Salameh. This attempt was most evident in March 2017 when Saudi King Salman bin Abdulaziz traveled to Beijing and reports emerged saying China could become the primary investor in the forthcoming initial public offering of Aramco, Saudi Arabia’s state-owned oil company. At an estimated $2 trillion, Aramco would be the world’s highest-valued firm, and China looks set to buy a substantial share of it. If China buys the share and is able to use its unmatched purchasing power to persuade Saudi Arabia to accept yuan for crude purchases, the global shift toward the yuan would accelerate. For some 50 years, the Trumpet and our forerunner magazine the Plain Truth have said a financial crisis centered in America will fundamentally reshape the world’s geopolitical landscape. In 1968, Plain Truth editor in chief Herbert W. Armstrong wrote: “If the dollar is devalued, inflation will almost surely result, and eventual economic collapse for the United States” (co-worker letter, March 26, 1968). Trumpet editor in chief Gerald Flurry writes about this prophesied trade war in his booklet Isaiah’s End-Time Vision, showing that Asian nations such as China will cooperate with European countries to block America and Britain out of world trade. “[W]e believe there may be a brief alliance between the German-led Holy Roman Empire and certain Asian powers (Russia, China, Japan—the kings of the east),” he writes. This prophecy is based on specific Bible passages recorded in Ezekiel 5 and 27, Isaiah 22 and 23, and Revelation 18, and is thoroughly explained in Mr. Flurry’s free books Isaiah’s End-Time Vision and Ezekiel: The End-Time Prophet. If China’s new oil futures contract succeeds in pushing oil-exporting countries away from the dollar and toward the yuan, it will hasten the deterioration of the dollar and set the stage for this prophesied siege. Bible prophecy shows that this will lead to a time of unprecedented devastation and destruction for America, Britain and Israel, and that the carnage will soon spread to the entire world. But there is some astonishingly good news tied to this looming catastrophe. Jesus Christ will interrupt that global conflict and bring in an age of peace and prosperity for all nations (Matthew 24:21-22, 30). He was born to be King of kings and Lord of lords in His soon-coming world government (Luke 1:31-33; Revelation 19:11-16). Its establishment is now just on the horizon. To understand more, read Mr. Flurry’s free books Isaiah’s End-Time Vision and Ezekiel: The End-Time Prophet.